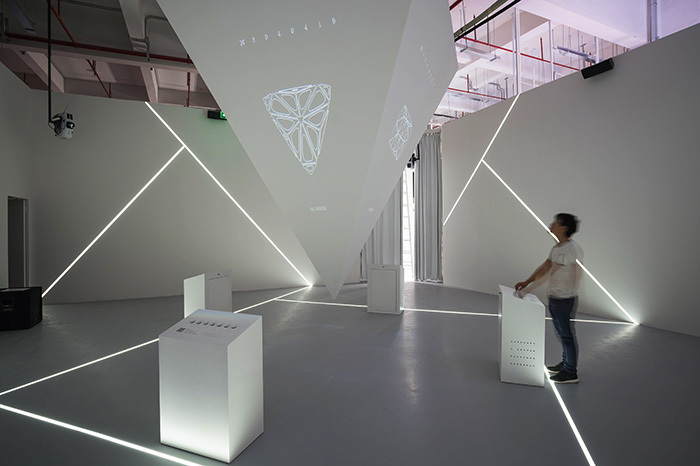 “Manifesto Cabinet” (2019), a 16-feet interactive sound and visual display installation, at the entrance of Design Shanghai exhibition hall. As a pioneering digital artist, Zhoujie has been exploring ways humans can interact with computer. The Manifesto Cabinet is programmed (or say, humanize) to have its own characters and certain way of digesting information. Audience can send their thoughts in text message to Manifesto Cabinet via scanning QR code, the Cabinet will process the information and read it out in its own tone. 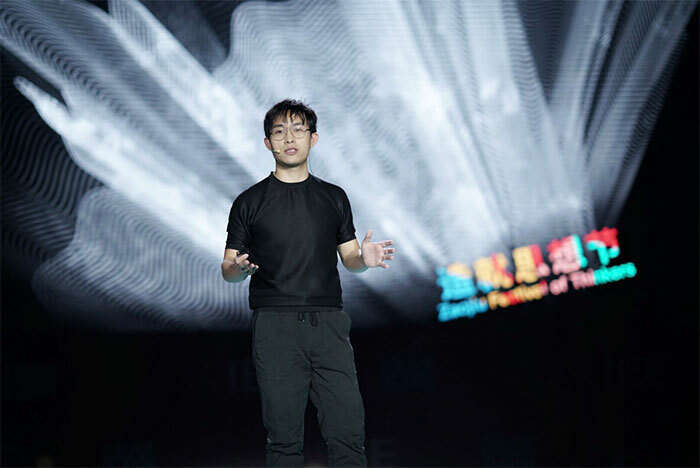 “A digitalized life attitude”, as Zhang Zhoujie calls, remains the center of his design concept. Products launched Design Shanghai 2019 include 1 barstool, 2 new chairs and 1 table from the MC collection. He further explores the structure constructed from lines and surfaces, “optimize the structure, simplify the style, and eventually only the frame or even just a single line”, says Zhoujie. 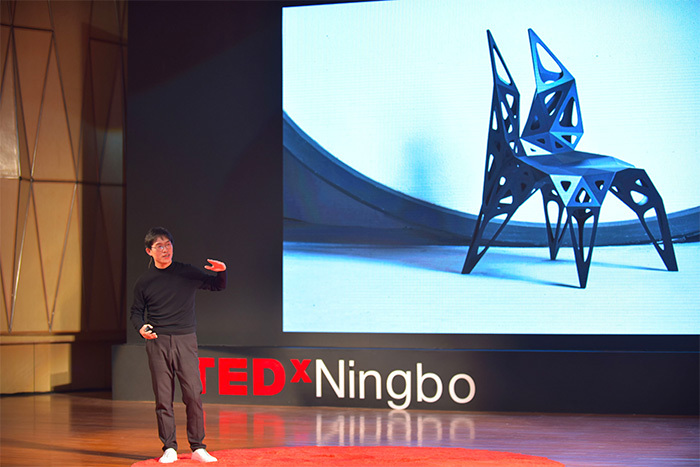 Zhang Zhoujie was invited as keynote speaker at TEDxNingbo, shared his latest art and design projects. Zhang Zhoujie was invited as guest speaker by British Council at Study UK, Discover you of Best of British exhibition. Zhoujie shared his experience of studying in Central Saint Martins, during his mater studies that he found his design philosophy and personal direction, and how he blends Chinese traditional art perspectives, western design methodology, digital engineering and handmade craftsmanship into a single project. 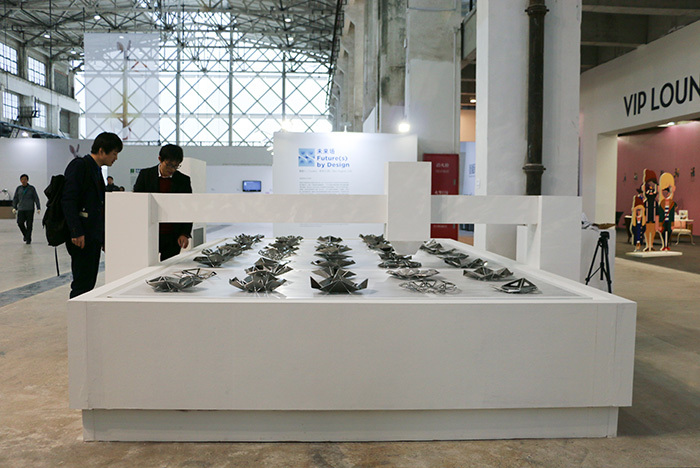 Zhang Zhoujie was invited by Modern Media, the curator of Lost & Found Museum, to create an installation for Shanghai Public Security Bureau Traffic Police Brigade. The pop-up museum promises to give interactive experiences that will ensure audience not dare to "drink and drive”. 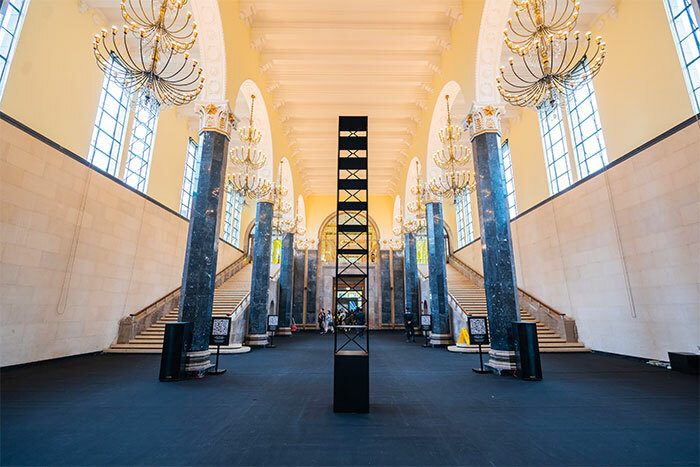 The installation is 60-meter long, made of mirror polished stainless steel, and with lights and mirrors, the reflects and shadows indicate tyre tracks. The golden items implies the occupations you may lost after DUI. 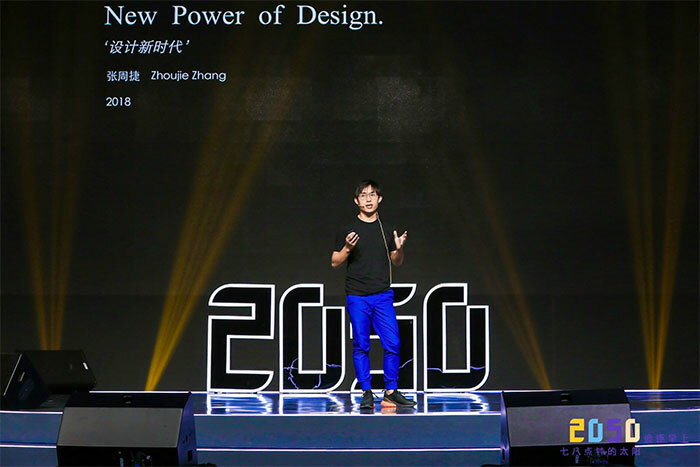 Zhang Zhoujie was invited by PechaKucha during Beijing Design Week as keynote speaker, talked about “ the power of computer creativity “. Whitebox Art Center is pleased to announce the Whitebox Young Artists Project curated by acclaimed designer Song Tao, “Minimal Logic – Zhang Zhoujie Solo Exhibition”. This exhibition presents Zhang Zhoujie’s new explorations in the field of digital and media art. 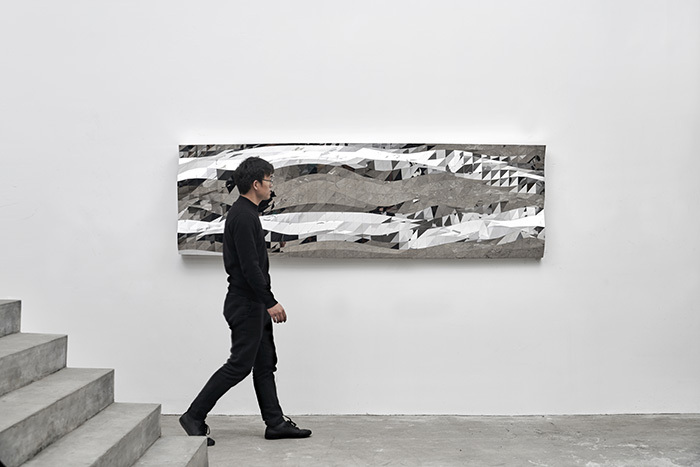 Having accumulated experiences over the last four to five years, artist Zhang Zhoujietakes the point and line from computer technology as his medium, to trace the transformations of a point in a sphere, cube and space. Starting with the work “Status#PIC1” series, to the installation, “Status#PIS-S” at the main lobby of the Whitebox Art Center, this work derived from “Status#PIS3-3” is not difficult for the viewers to conceive the logical trajectory Zhang Zhoujie has designed, that those seemingly clean and unrelated points, lines, cubes conjure into myriads of shapes and forms, and their inseparable relationships herald the possibility and continuity in the development of things. Considering the theme of the exhibition, “Minimal Logic”, is also the artist’s way of appropriating the “point” to convey a logical relationship to a digital dimension. 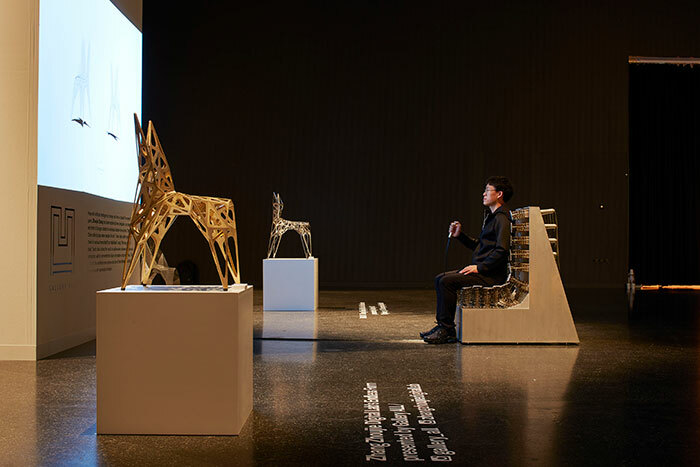 09 June, 2018, Basel, Switzerland - For Design Miami/ Basel 2018 Design at Large, Gallery ALL presents Formation in Action: The Sensor Chair and Design Auto-Genesis, by Zhang Zhoujie Digital Lab. 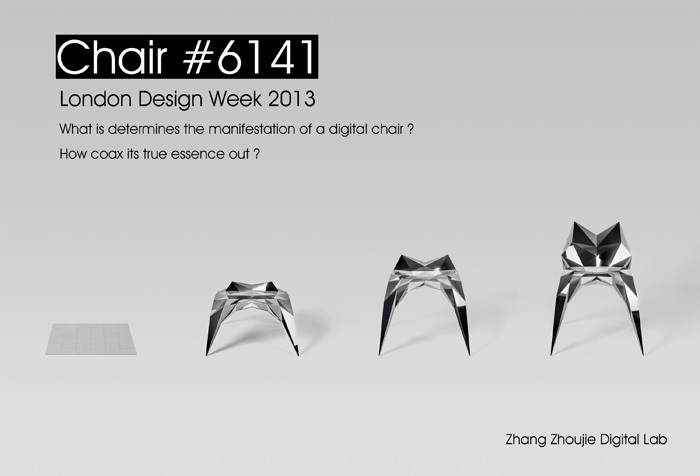 It is the first ever presentation of Zhang Zhoujie Digital Lab’s complete Endless Form project in its entirety, featuring fifty variations of its chair designs, together with the tactile-sensitive Sensor Chair and live visualizations of the self-generating chair designs as they are in formation via user interaction. The exhibition will be on view from 11 May - 17 May, 2018 at Hall 1 Süd of the Messe Basel. In the entrance of the reception hall, guests are welcomed by a lyrical light display. 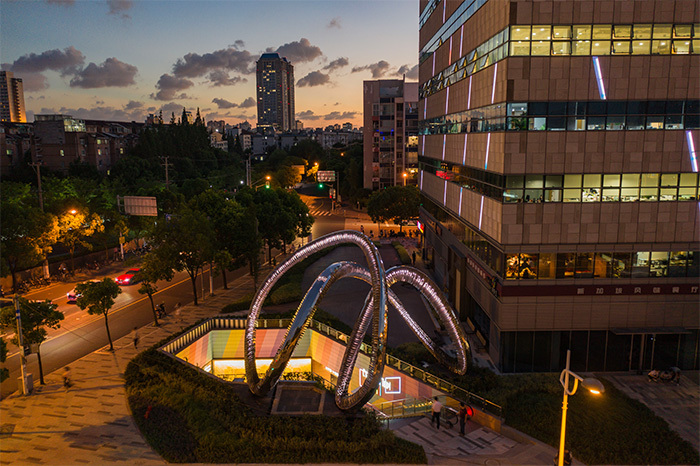 Created by Zhang Zhoujie Digital Lab, this LED light instillation showcases the the synthesis of digital control and user interaction. The four instillations flow unpredictably, occasionally locking into a synchronised line, or suddenly turning away from each other like the hands of a clock. As visitors pass by, the instillation springs to life, enlivening the greenery along the wall with surprising and rhythmic movements. This work infuses the beauty of the organic and digital technology. Sprouting out from the garden pond, a LED light instillation shimmers and sways with life like reeds against the wind. 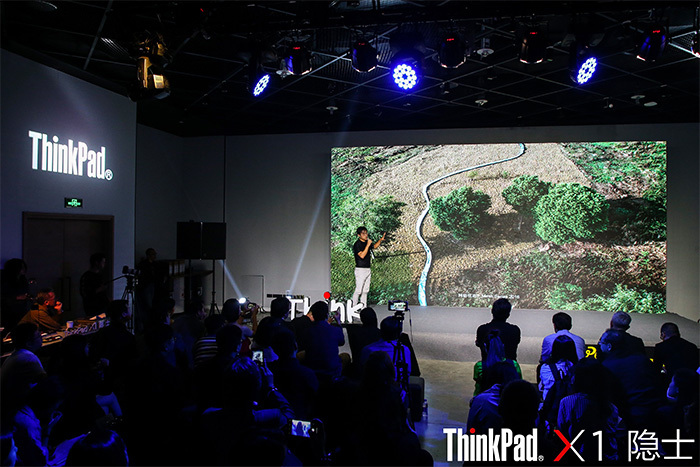 This is also created by Zhang Zhoujie Digital lab, and evokes a harmonious scene between new technology and nature. 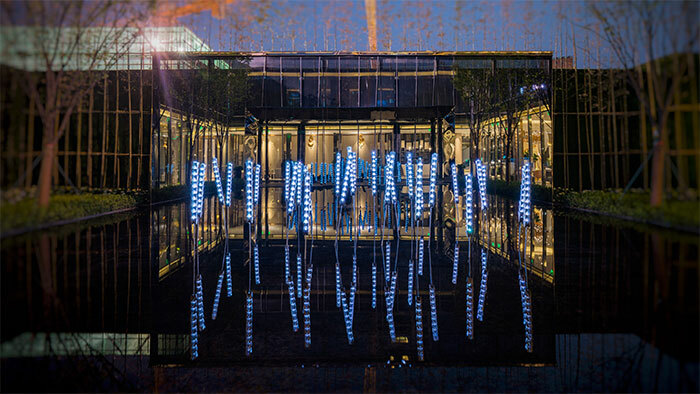 This instillation is composed with numerous luminous strips emerging from the water. The movements which mimic the gentle swaying of reeds in a river are created by internal motors, allowing rhythmic motions, undulating with light and shadows. The animated nature of the instillation suggests the poetic and romantic affect of new technology. 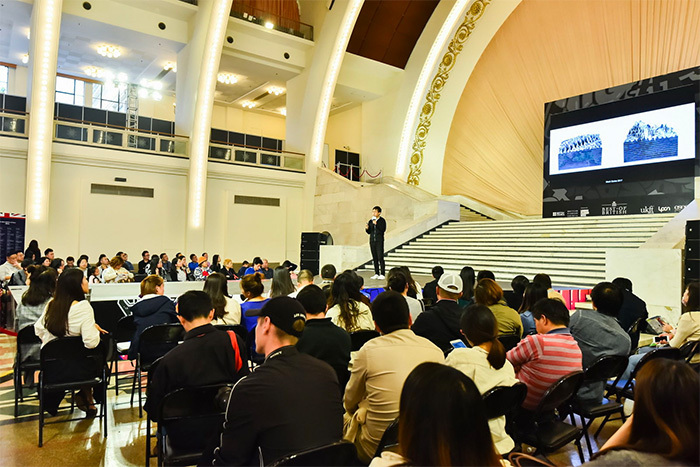 2050 conference, hosted by Hangzhou Yunqi Science and Technology Innovation Foundation, brings the world’s youths together for science and technology. The World Innovation & Entrepreneurship EXPO (WIEE) is founded on the concept of socialism with Chinese characteristics. With the support from the Ministry of Science and Technology and Shanghai Municipal Government, and within the framework of Pujiang Innovation Forum, Tongji University has initiated, and will host, WIEE to further actualize the national strategies of promoting the development by innovation, revive the country by science and education, and strengthen the country by talents, accelerate the municipal construction of a globally influencing science and innovation center, promote the transformation of scientific and technological achievement, build a cooperation platform, transform the economic society, and reform the systems and mechanisms in Shanghai. Zhang Zhoujie, as invited speaker guest, shared his art/design philosophy. For Design Shanghai 2018, Zhang Zhoujie Digital Lab, a pioneering digital art studio, will present a new design brand Endless Form®, presenting a series of revolutionary and disruptive digital furniture products. 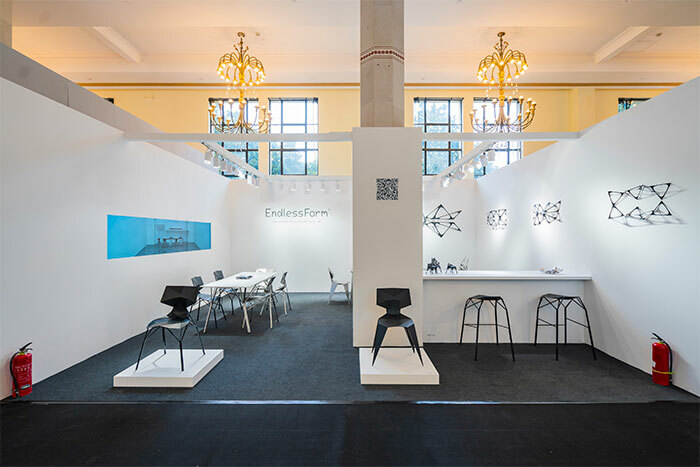 The concept of Endless Form also provides the theme of the exhibition, together with eye-catching wall installations, desks, tables, coffee tables, and other furniture. Each piece of furniture is unique and has a futuristic perspective – the designer is not a person, but rather a computer. Mesh 2017 is an extension of the research carried out in 2016. Compared with the previous moderate state, this new collection explores the difference of the intersection of two water ripples, creating a dynamic relationship, presenting an intense and dramatic change in height, which requires much more detailed fabrication. 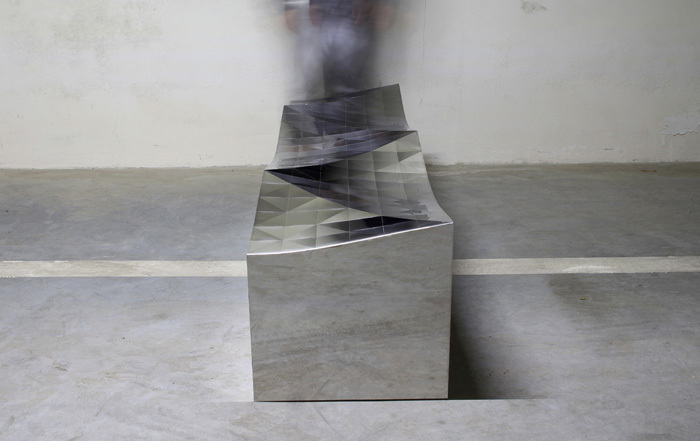 Looking down the matte stainless steel installation, two triangle Mesh create an illusion of a forming square, that overall looks like the texture of geomorphy, which is another kind of view of geometry. From ripples to waves, Mesh digital language is good at simulating the state of a stream, and can present the vivid flow of waves. The focus of this research is on the flow of water between two points. The computer automatically generates various points of high and low, and finally creates a vivid water fall installation, hanging in space, providing different angles, allowing the viewer to feel the complicated three dimensional details formed from Mesh. Computers have begun to infiltrate the formation of all things. 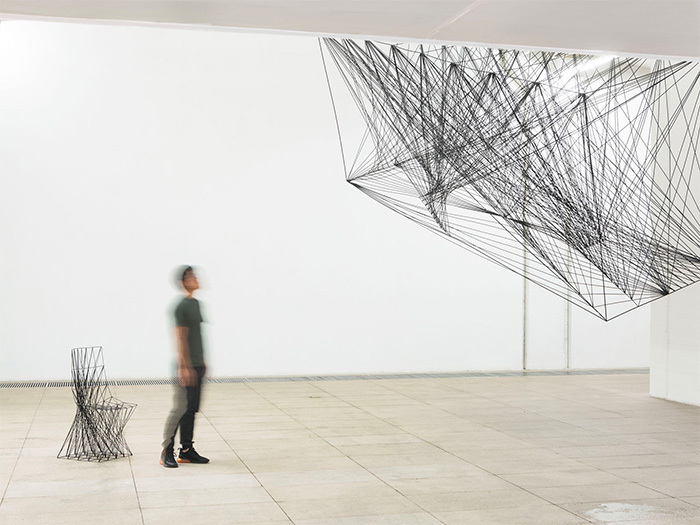 Zhang Zhoujie Digital Lab focuses on “Mesh”, a primary graphic language, exploring the various transformation processes of dot, line, and surface. This exhibition extracts and purifies the various states of Mesh into a series of installations and functional objects, revealing the possibilities of this digital language, from virtual to reality. 2016.09.21 MS‐06, Back to Nature, Yangchenghu land art Installation. 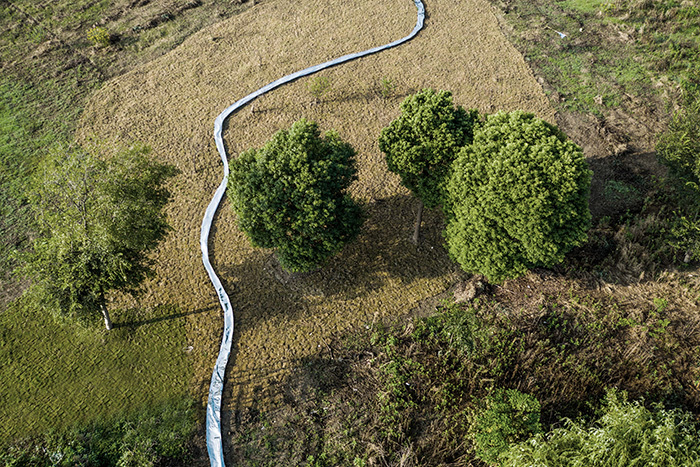 Zhoujie Zhang Digital Lab and architect Kunkun Chen collaboratively conceived a digitally simulated river installation for the Yangchenghu Land Art Installation Festival, which opened in September of 2016. The piece incorporated landscape metrics to create a waterway installation that blends in flawlessly with the natural environment. 2016.06.02 Mesh F Gate #03, Football Goal commissioned by Nike lab x158. 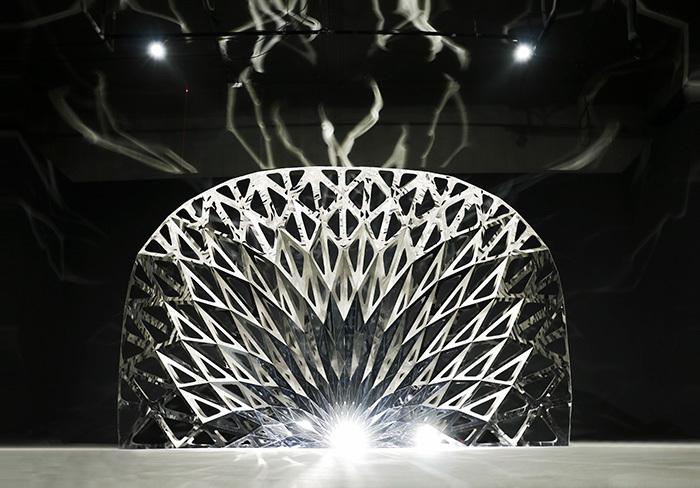 With the coming 2016 Europe Cup, Zhoujie Zhang Digital Lab was invited by Nikelab x 158 to create a radius structure digital football goal, modeled after the standard five-a-side football goal. 2016.05.19 'Randomness of Design', Solo Exhibition. May, 2016, Zhoujie Zhang Digital Lab collaborated with Yihaus and The Unreasonable, part of international creative agency Anomaly, to exhibit the conceptualization to realization of digital design products. 2016.03.05 'Mashing Mesh' new series unveiled in Design Shanghai. 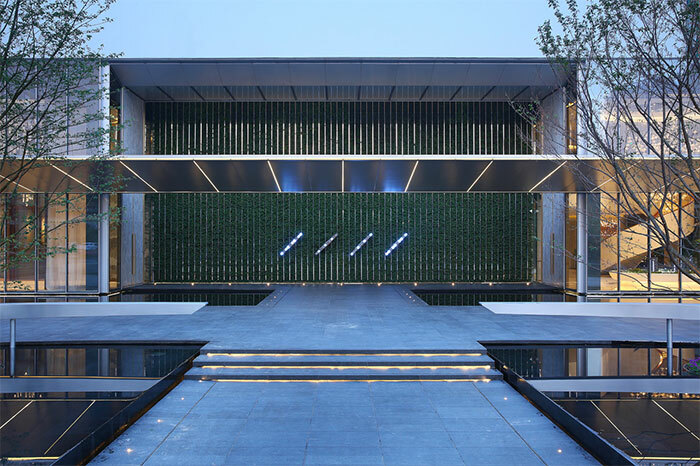 At Design Shanghai, which opened in March, 2016, Zhoujie Zhang and Gallery ALL together exhibited a new collection titled, “Mesh Series.” Five brand new pieces and two audio interactive multimedia pieces were exhibited. 2016.01.10 'TRANS‐DESIGN' Shanghai Art & Design Exhibition, West Bund. 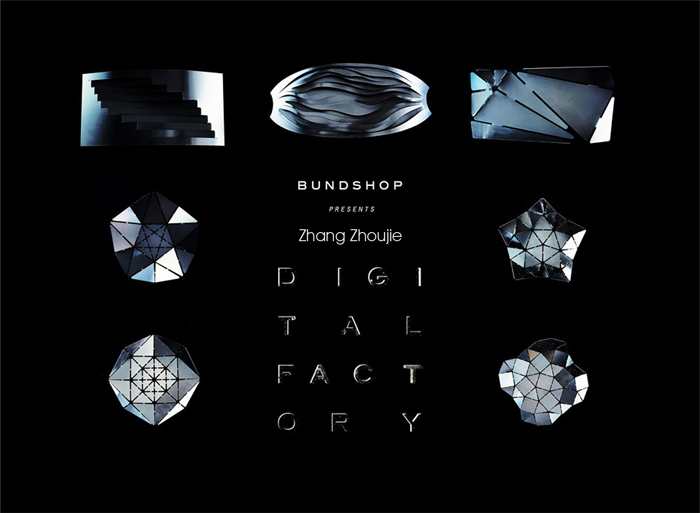 At Shanghai West Bund Art and Design Biennial in 2016, Zhoujie Zhang Digital Lab presented the Digital Vessel collection based on the “Digital Factory 1.0” theme, and integrated an interactive experience for users to custom digital design fruit plates. 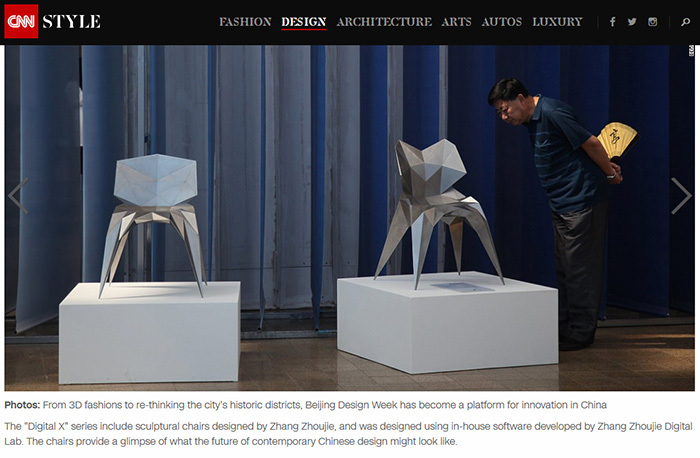 2015 10 Digital X Series @“INDIGO – Designed to Delight” in Beijing Design Week. 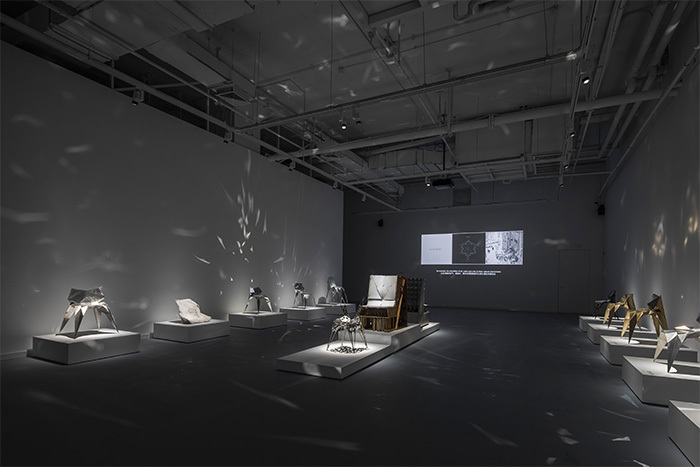 During the 2015 Beijing Design Week, Zhoujie Zhang Digital Lab presented Digital X hand-drawn stainless steel collection in the “INDIGO – Designed to Delight” exhibition. Renowned curator Ben Hughes curated the exhibition. 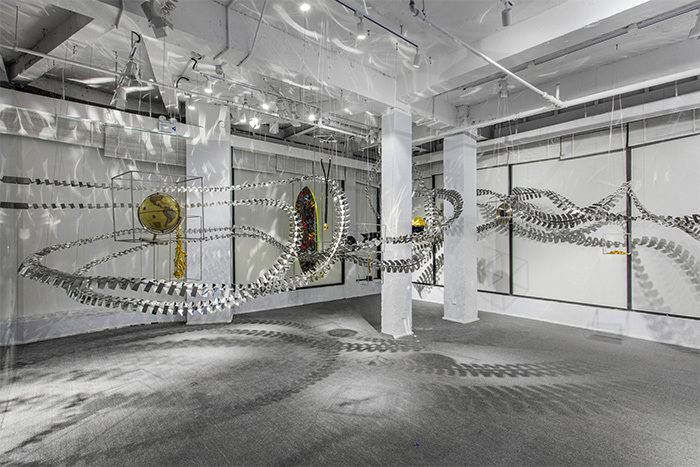 2015.11.06 'Two Curves in Vibration' installation unveiled in Beijing Design Week. ‘Two curves in Vibration’ debuted in “INDIGO – Designed to Delight” exhibition at the 2015 Beijing Design Week. The installation, created in acrylics, is both futuristic and soft, giving the attendees a brand new experience with digital sculptures. 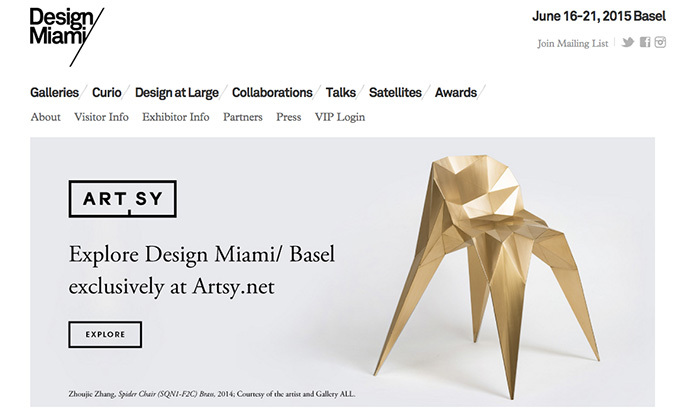 2015.06.16 Design Miami/Basel , @ Gallery All. Zhoujie Zhang’s brass collection collaborated with Gallery ALL debuted at Design Miami/Basel in June, 2015. 2015.03.10 'Rising Asian Talents' Award, Maison&0bject, Singapore. 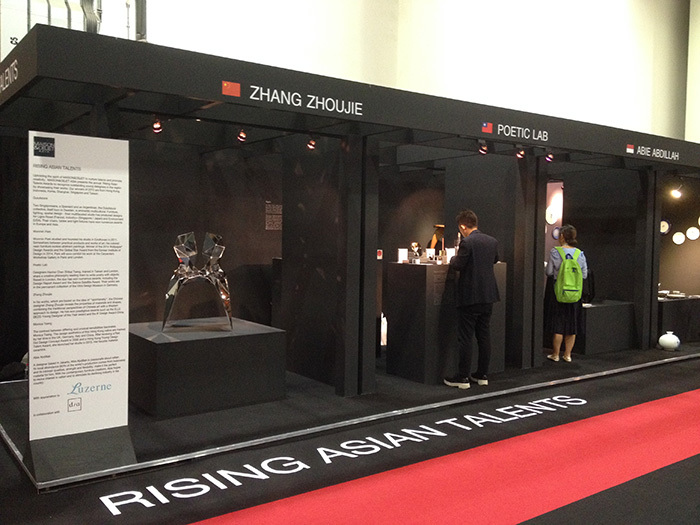 Zhoujie Zhang was named one of Maison & Objet’s “Rising ASIA Talents” late 2014, and subsequently presented his Triangulation collection at M&O in Singapore, March, 2015. 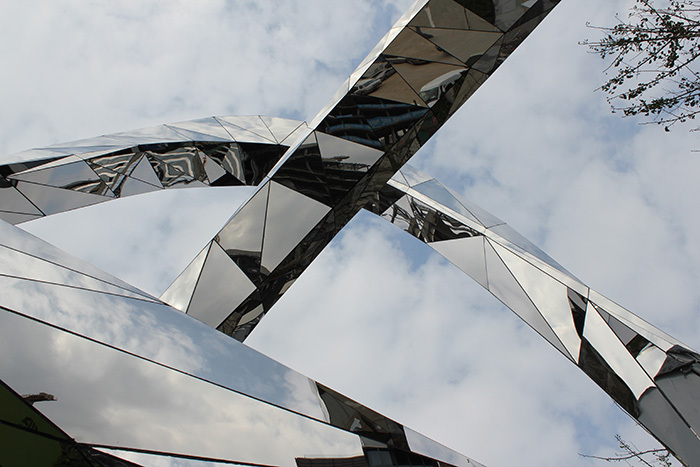 2014.11.19 'Cross' Digital Sculpture Finished at Vanke,Hongqiao Center, Shanghai. 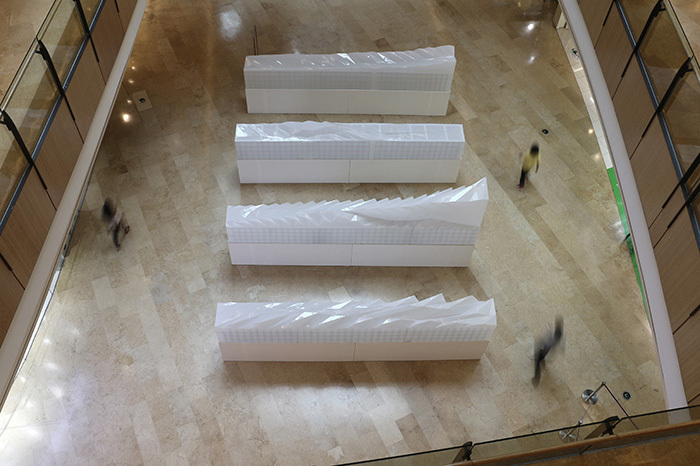 Zhoujie Zhang Digital Lab created a digital sculptural installation for real estate developer Vanke at Vanke’s Hongqiao Center. The parabola symbolizes the location’s importance as a center and hub. 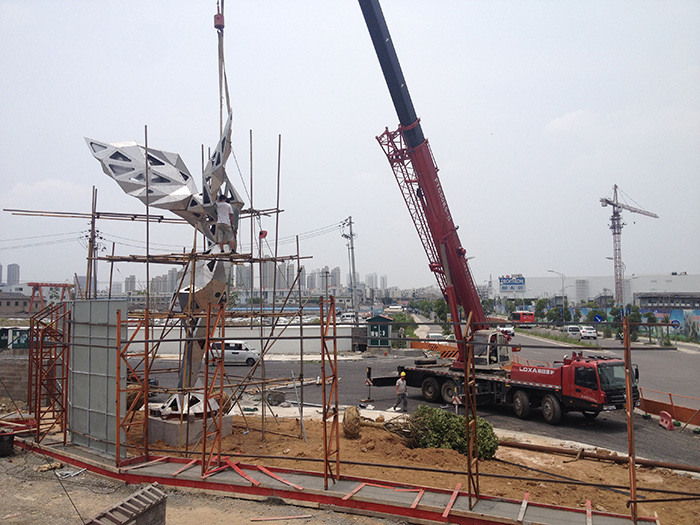 2014.06.22 3rd Digital Sculpture finished, Corporate with Ningbo artist Zhang Cong. Zhoujie Zhang digitally scanned an angel figure created by artist Zhang Cong and transformed it into a metallic, laser-cut angel sculpture that stands at 10 meters tall. 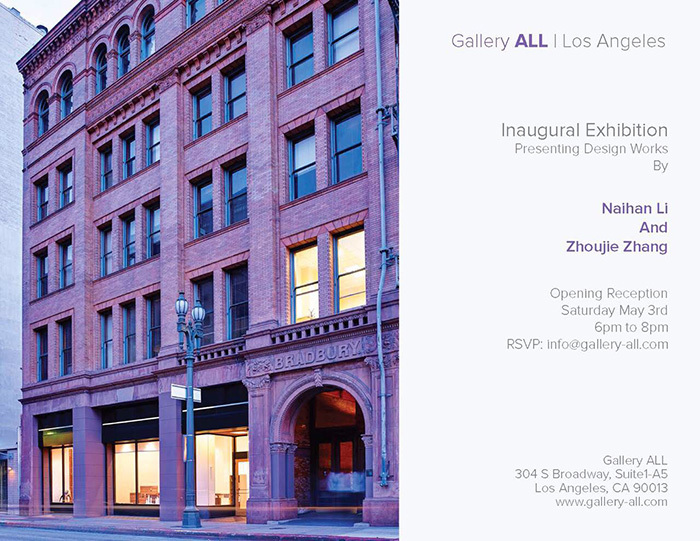 2014.05.03 'Inaugural Exhibition' Launched in Gallery All at Los Angeles. 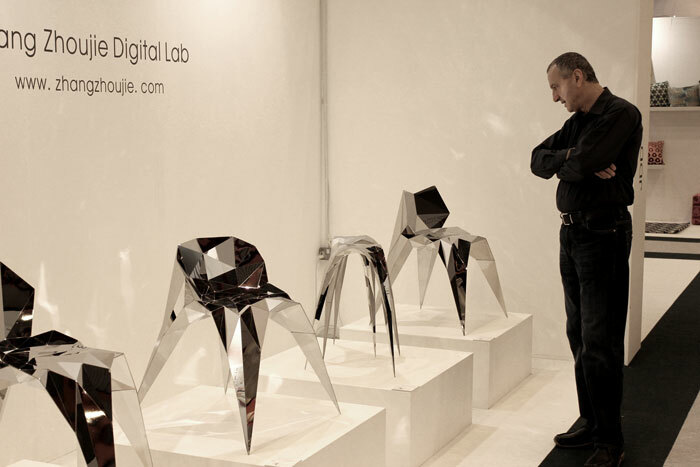 May, 2014, Gallery ALL exhibited Zhoujie Zhang Digital Lab’s famous collection – Triangulation, the stainless steel, digitally designed furniture collection. The exhibition also featured brass renditions of the design for the first time. 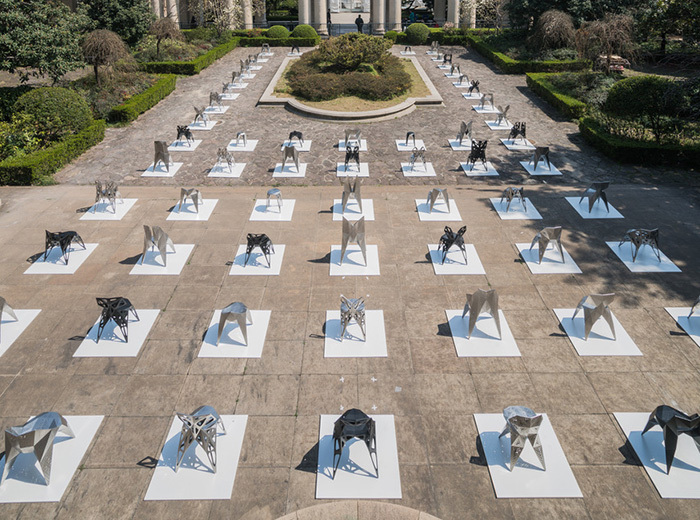 2014.01.22 First Digital Sculpture Finished at Shanghai. 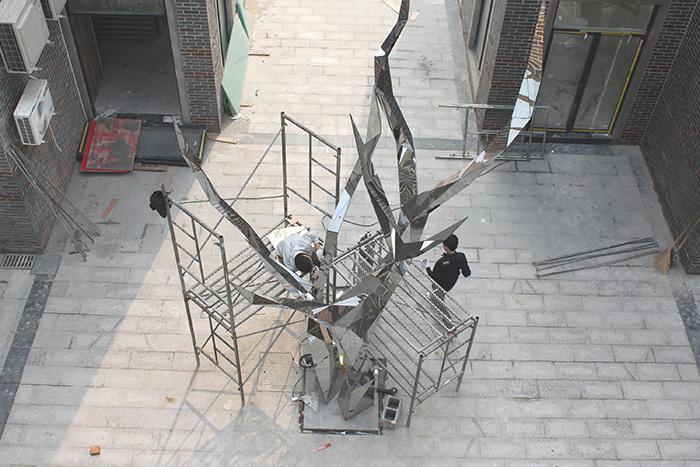 Zhoujie Zhang Digital Lab was commissioned to create two 6-7 meter tall Digital Tree sculptures in Shanghai’s famed Korea town, known for its cuisine and retail offerings. 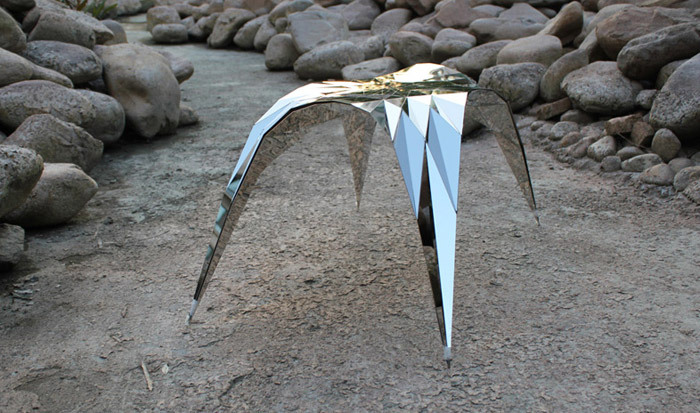 The sculptures explored entirely new possibilities the incorporation of digitally created landscaping. 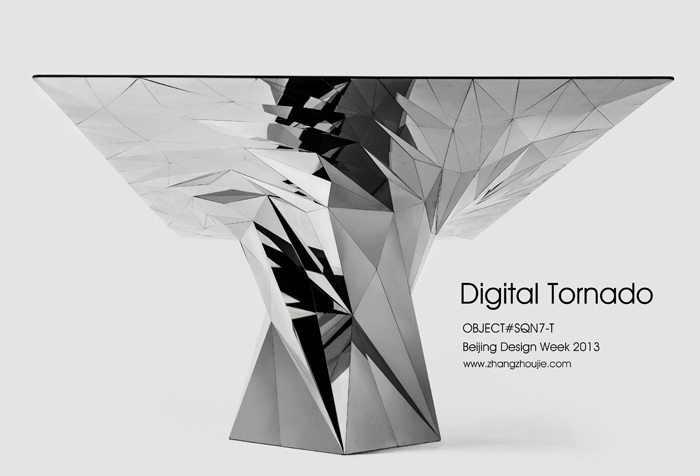 2013.09.26 'Digital Tornado' Launched in Beijing Design Week. After 3 years of development, ‘Digital Tornado’ OBJECT # SQN7-T will finally be launched. It originated from a design experiment in 2010. How do digital outputs link to daily life? This is the first try of consumer-facing digital products. The integration of digital output and traditional craftsmanship has given the product new meanings which differentiate it from other industrial products. Chair #6141 is only one in thousands of variations; it intrinsically shares the same DNA with all the pieces. The series is an evolution of the new digital crafting age. 'I think we are in digital age already, and we are coming to the crest of digital objects. I believe that objects in digital world will grow as nature does, in an organic way, but we just need to discover why and how that happens.' said Zhoujie. 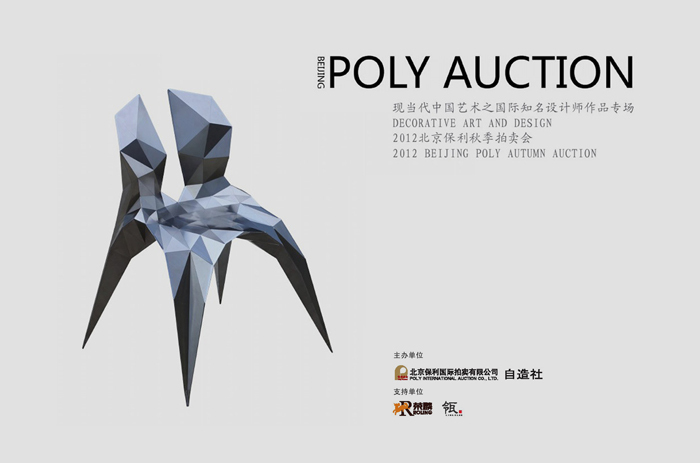 2012.12.30 First launched in Poly Auction on Cover page, Beijing. 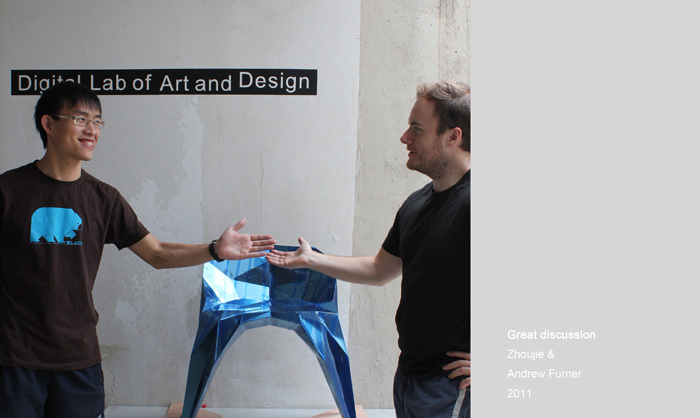 Zhoujie was highly recommended by the committee as an emerging designer. He was featured as the cover story not the annual catalogue to represent new Chinese contemporary design. 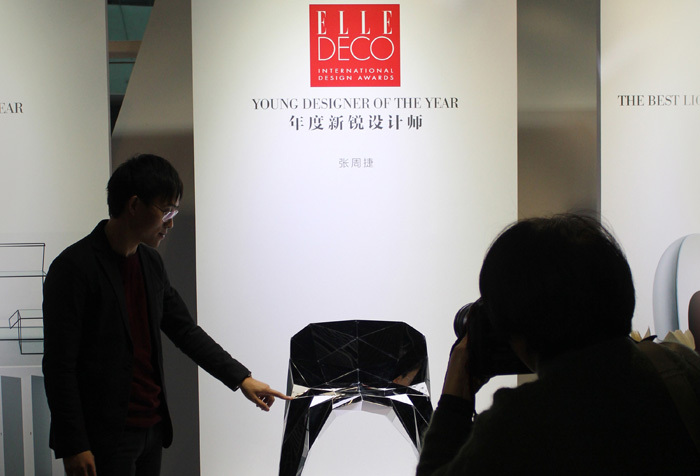 2012.12.20 YOUNG DESIGNER OF THE YEAR, EDIDA China. At Zhoujie's very first solo exhibition of his entire collection, about ten thousand visitors came to the exhibition in one night. 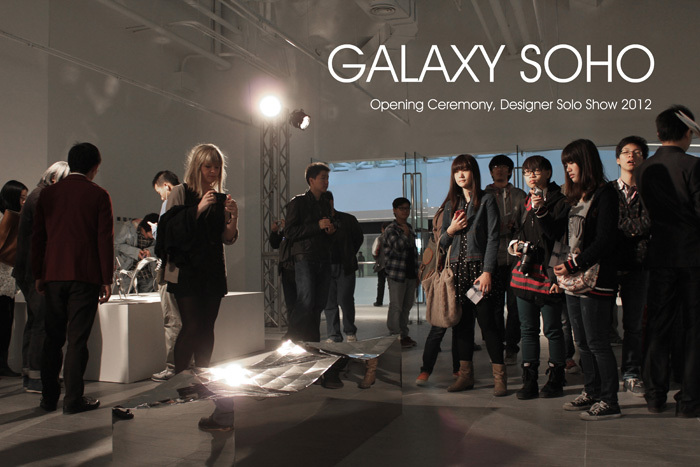 2012.11.28 Galaxy Soho,Opening Ceremony Show. First time to exhibit Zhoujie’s whole collections and about ten thousand visitors came to the exhibition in one night. 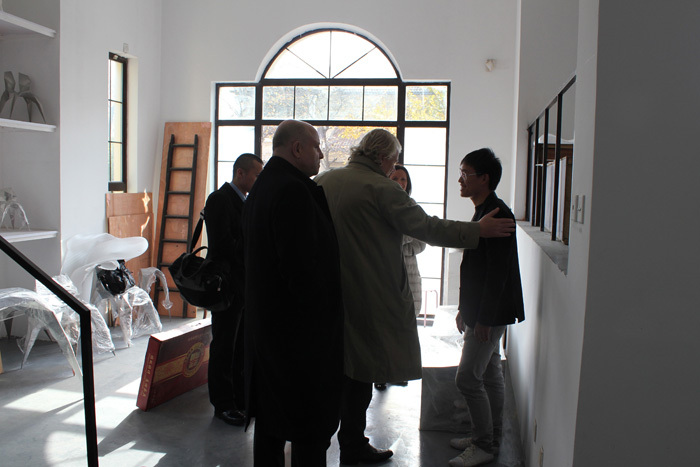 2012.11.25 Poltrona Frau CEO, Dario Rinero visited new studio in Songjiang. 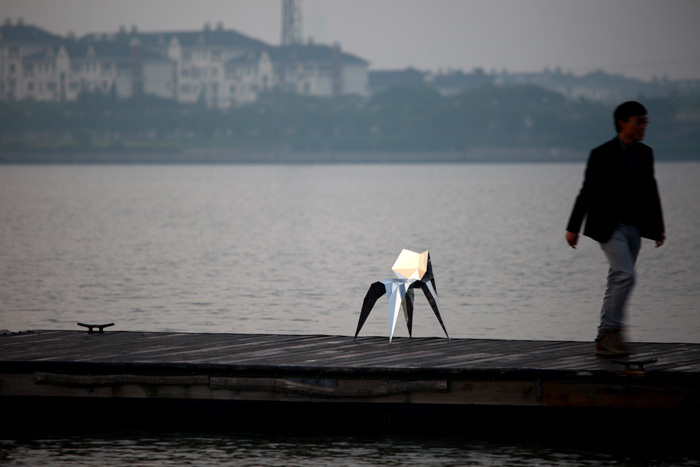 New work launched in Design of Designers, Shanghai, 2012. Stand A44, SaloneSatellite 2012, Milan. 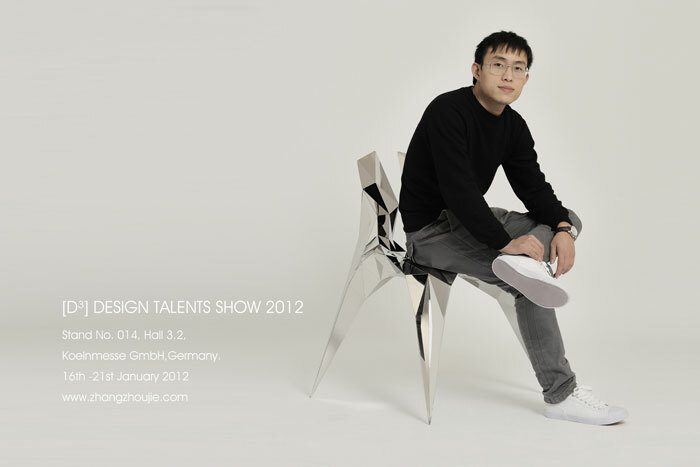 On D3 Design Talents Show, Cologne, Germany. 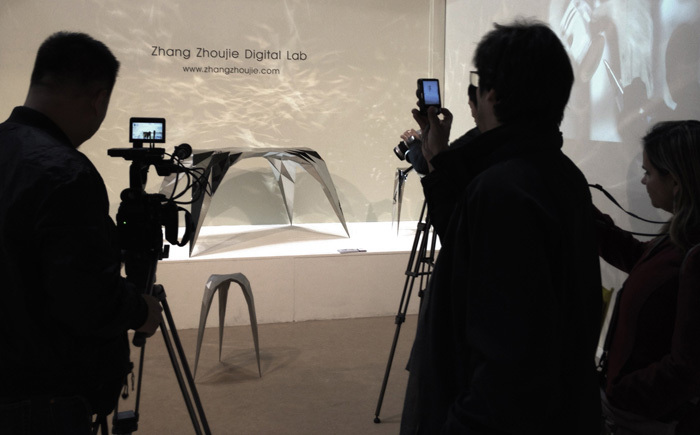 The first successful unveiling of Digital Lab was at 100% Design London. After numerous chairs have been made, new objects are still being developed. Many thanks to my fellow CSM Graduate, Andrew Furner, for flying to Shanghai for further project development. After many rounds of testing and prototypes, Object #SQN1-F2A became first workable model and is collected by a noted Chinese Architect. 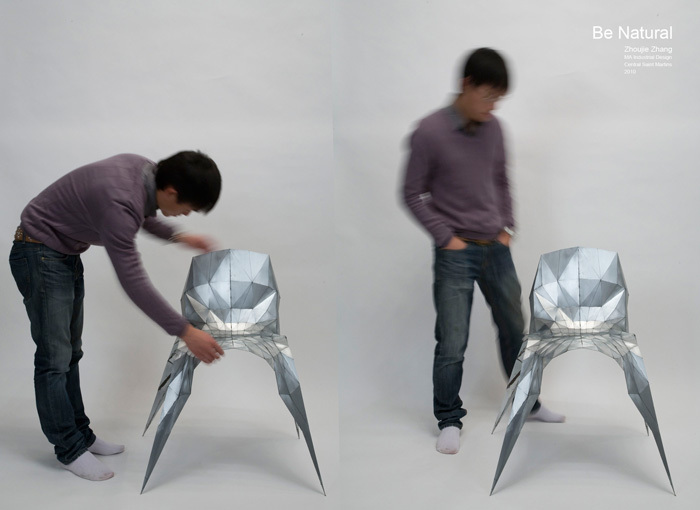 First prototype was released at the MA Industrial Design degree show at Central Saint Martins, 2010.